A few disclaimers. This page will likely stay here until after the quest goes live on the US servers. If you *do* use it as a guide, please know that it's a translation (which are never perfect)! Don't follow the guide blindly (actually read what the NPCs have to say, technically, you're supposed to be able to do the quest with the information they give alone) Also, please help us by emailing us screenshots and information about how it worked on the US servers so we can update it. Thanks! 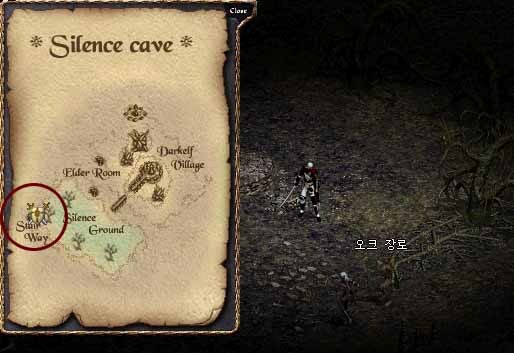 Near the center of Silence cave will be the Dark Elven Guards. You'll need to speak to one of them to start the quest. He will want the head of an Orc Elder. The Orc Elder spawns in the southwest, by the stairs which lead to the overworld. You will need to kill it. Return the Head of Orc Elder to the Orc Guard and claim your prize, a Con's Pouch. Inside of it will be a Shadow Mask and a Spirit Crystal: Bring Stone. This spell is a critical part of being a Dark Elf. You cast it on a Dark Stone and it has a chance of evaporating or becoming a Quality Stone. There are further stones that can be obtained, but we don't understand it yet. 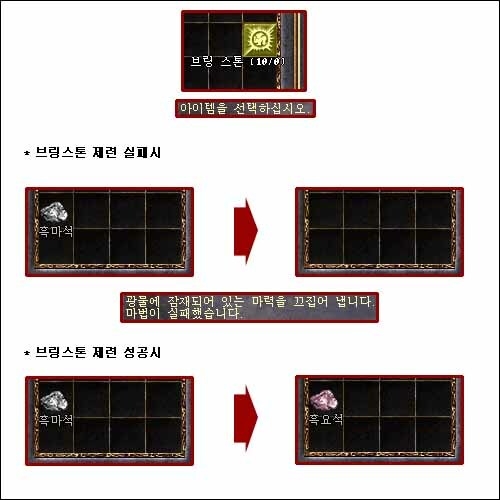 However, this stone system is very important in the item creation aspects of the Dark Elven.